One of the most magical parts of Christmas has to be the stories. The children adore books and love story time, especially at this time of year when our bedtime reading takes on a Christmas theme. 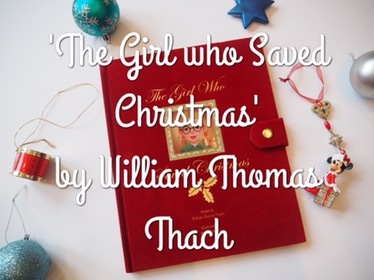 The Girl who Saved Christmas is a festive tale about a young girl, Molly, who reminds Santa what Christmas is all about after he’s left disheartened that all children appear to have been bad this year. The book itself is beautiful and soft, it’s a brilliant deep red colour embossed with gold writing – totally festive and totally luxurious – a big thumbs up from me. The children loved that the back page had a letter to Santa to be filled in. The book is currently only available in America on Amazon.com – however, the e-book version will be available shortly in the Uk. In the meantime, you can listen to the full story on YouTube. It’s the perfect tale to read whilst snuggled up on Christmas Eve in new pjs with a festive scented candle burning in the background. The Girl who Saved Christmas was sent to us for the purpose of review but all opinions are our own. How sweet, leanora loves books and as upsetting as it is not being able to purchase here in the UK i know what we will be listening to this evening.